Bike parking in the city can be a tricky business. Many parts of the city (at least the ones I visit in the District) do not have enough racks to accommodate all the bikes of those who want to park in the area. 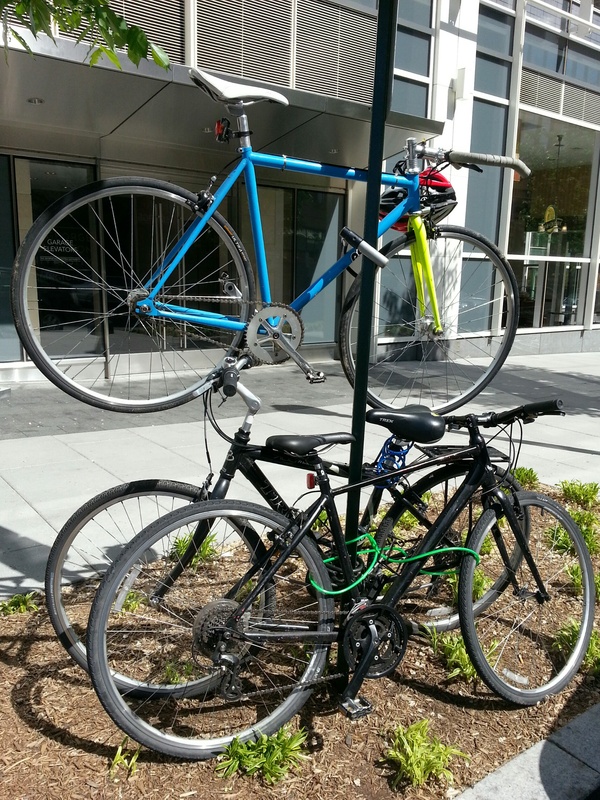 Bikes get crowded onto racks or, if those are not available, we seek out other alternatives such as locking to a parking sign pole or other pieces of metal that look sturdy and theft-proof. I don’t drive in the city, but I suppose that bike parking is far less of a problem than car parking. It’s certainly much cheaper! 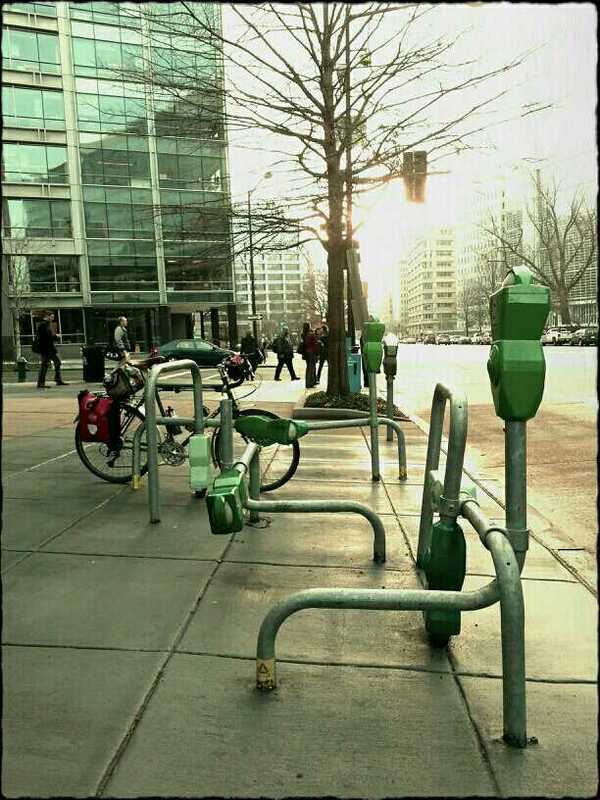 Even so, D.C. is not a bike parking paradise– not yet, anyway—which means we often end up parking in uncomfortable proximity to others. Drop bars intertwine awkwardly with flat bars. Miscellaneous pieces of metal from one bike sidle up to those of another. I think that a general lack of decent bike parking is my main issue with “art” bike racks. If the city already had ample racks for bikes, I would think they were a fine addition to the city. However, unless an artsy bike rack can fit bikes like a basic inverted “U” rack does, I do not see their value. An art bike rack is not going to inspire more people to bike, and I don’t think they add that much to the aesthetic of the city, just as an inverted U rack does not detract from it. But I digress. I accept that uncomfortable bike intimacy is the result of life in a city where people are riding more and bike parking is limited and deal with it every day on my commute. However, one day I went to retrieve my bike and discovered that someone’s extrication of his or her bike from the work rack caused my bike to fall on the ground. It was just lying there, poor dejected bike. Because of the way I had parked the bike I know that the only way it would have fallen over was from an external impact like pushing the bike out of the way, say by shoving the handlebars. Later I accepted that I had potentially contributed to the situation by only locking the bike by the down tube, which left it less stable than if I would have locked the front wheel and the down tube together to the rack. Doing that would have made it tougher to knock over. I had always thought that if my bike fell over that the cyclist who helped it get there would pick it up. Who knows, maybe this has happened to my bikes many times in the past, and I’ve not even been aware of it. I thought it was part of the code—not the Bike Commuter Code, but one of its subparts, the Bike Parking Code—to pick up someone else’s bike if you had a role in knocking it over. That’s what I do. I thought it was what everybody did. Being a Midwesterner, where there seems to be more personal space for everyone to move about, these types of issues can really get to me. Crowding can get on my nerves. Most times I shrug it off and think of it as life in the city. But seeing my bike disregarded and flopped on the ground hurt my feelings, especially when I am 98 percent sure it was a fellow cyclist who helped cause my bike to fall. What do other riders do? If someone else’s bike fell while you were removing yours from a bike rack, would you stop to upright it? Or is there no established etiquette for this sort of thing? If your bike fell over in front of me, I would pick it up. I promise. I always do that, and it also annoys me when I find my bike has been messed with. I do lock mine so that it doesn’t fall down, though. Yeah, my locking technique was my first mistake. I usually am more mindful about how I lock it. Even so, bike falling = bummer. I agree. I wouldn’t just leave a bike on the ground like that. That just seems wrong. Crowded racks can result in damage even when parkers are careful. I’ve had the seatback on my recumbent torn (not an inexpensive thing to replace) by someone’s extra wide mountain bike handlebars. On more occasions than I care to recall I’ve had my handlebar tape damaged by the same. Still, I’d rather park a bike in the city than a car. Tomorrow I have to park two cars downtown during the afternoon. I am not looking forward to it. Yeah, the parking is super tight. AND I was just looking at some new racks I saw installed at one of the remodeled govt. buildings, and I don’t know how people are going to effectively park there. The spaces are super crammed together. Still, it does beat car parking. Don’t get me started on bike parking. Hardly anywhere is covered parking provided, but abroad in countries like Switzerland every school provides spaces for bikes protected from the elements. Bike parking here often feels as if a developer has checked off a government requirement by putting a bike rack somewhere on the property — usually in a place that has few eyes on it and is an invitation to theft! Your “reenactment” of the drama is well done and very sad indeed! The victim should not blame him- or herself; mindfulness is a practice not a perfection. One solution is to commute on a bike you don’t care about, but that would take away part of the pleasure of biking. Thanks for the compliment on my true crime dramatization! I agree with you wholeheartedly about parking here! I really dislike it when I cannot find a covered spot or I see a bike rack installed in a completely idiotic way. It does feel like “we’re doing this for minimal compliance.” I did move my bike to another spot that is less likely to be messed with. So far, so good! i used to ride more, when younger and in the cities, than i do now, in alpine alaska. :). Thank you, pencilfox. I know you would! Even if it may be a few steps further from my destination, I always seek out the “lone-pole” (parking sign, streetlamp pole, etc.) which I can securely lock my bike to. Sort of like the car that’s parked in the furthest corner of a parking lot. It does help.. at least most of the time. It’s certainly worth the few extra steps. I try the lone-pole approach too. 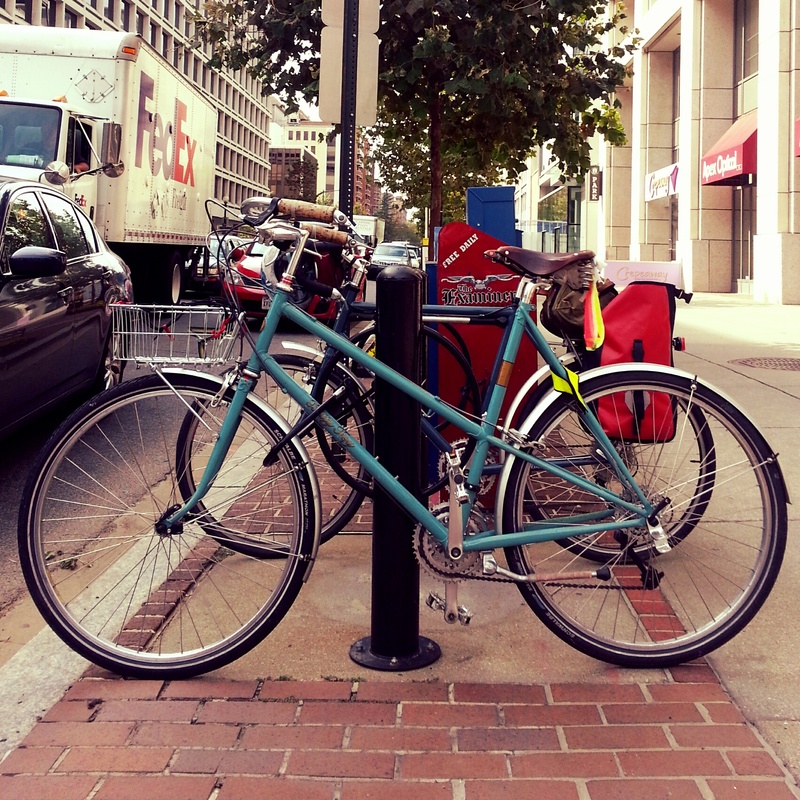 Sometimes it’s ruined, though, when another bike comes along to share my lone-pole! It always makes me feel like I’ve been outsmarted, too. I pick up things I knock down and often things other people knock down. I agree with you on the artsy bikeracks but I guess the plus is fewer bikes mean less potential for damage. I did bike valet last week at the Herndon Festival and was quite concerned about damaging the bikes people left with us! Some were high dollar racing bikes! It’s not a rider question. It’s a human question. Do you live by the Golden Rule, or not? That is a bummer. I would think a fellow cyclist would pick up a bike. I guess it’s true that there are jerks in every demographic. I would totally pick up your bike, or anyone else’s. The building where I work just put in a locked gated area but the bike racks are too close together and cramped trying to get in and out. Sigh. Being an engineer apparently doesn’t require forethought anymore – our building also had to install a handicapped button on the side door — and they put the access key panel right above a standpipe, (troublesome for anyone in a wheelchair) so they had to move it. DUH. I would love to do a post on the incompetent bike rack installations I’ve seen, but it might be too depressing! It’s obvious that cyclists are often not at the table when decisions are made. 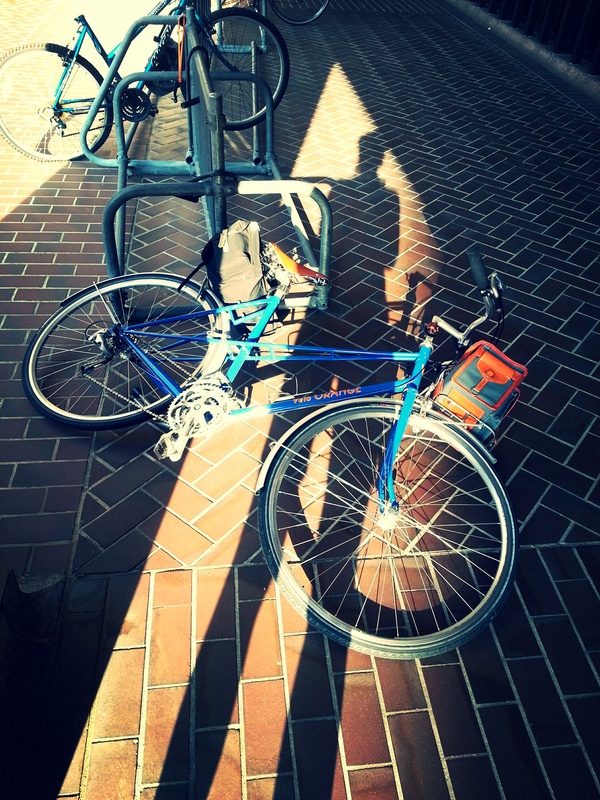 I had a case like that a few years ago….The bike wasn’t locked because it was at the overnight on a week-long ride, but mine was one of several lined against a building. I came back to find it lying on the pavement. Talk about irritating. And to top it off, my helmet was strapped to the drop bars and cracked in the fall. I personally can’t imagine causing a bike to fall and just leaving it. I pick up bicycles laying on the ground just like I straighten remainders at the book store and carefully drain glasses of beer. Each act gives life meaning while blunting some of the harsher edges of existence.